I ran into a fun website today – and wanted to share. Although this posting might not prove to useful for a bride or groom, this is without a doubt of huge interest to my fellow photographers! I always try and keep an eye out for the new gadgets coming out to help with photography related work-flow issues. I also try and keep an eye out for all around sweet technology stuff. So what happens when you find a way to combine my Canon 5D Mark ii with my iPhone? You have what can only be described as a match made in heaven. Soon to be released any day now (hopefully – c’mon Apple!!) 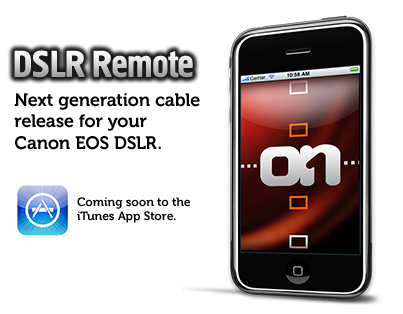 is a new app for us photogs who own an iPhone. onOne software has introduced (in my opinion) a revolutionary little application that gives shooters the ability to wirelessly (albeit with a laptop attached) fire our Canon DSLR’s. “c’mon Brett – I can do that with my good ol’ pocketwizards – and without the laptop!”. You can – but wireless triggers don’t give you wireless manual control, and the ability to view the images on the fly. That’s right – with this nifty little app I can fire my camera from my iPhone. What’s more? If the camera has “live-view” mode – we’ll be able to see the image before we snap! I can’t say I’ve used the app – I can’t wait to though! As I said, the app is still pending review and approval from Apple. It’s one app I’m sure to download though – what a treat this will be! Want more information? Head on over to onOne softwares’s blog page, and check out their fun little video on how it works. Amen to that. The flow and advent of creative technology is really amazing. I’ve learned that being a creative professional means constantly investing time keeping up to date with trends and tech. I’m sure you know this as well, owning a design studio and all, but it really is a strange (and great) time to be a creative. I’m pretty sure that an app to tackle anything creative or necessary that I’ve even casually pondered is being released any day now.